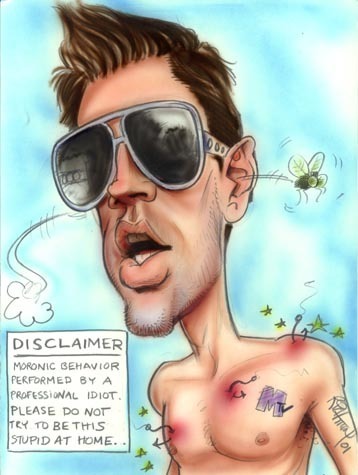 Cartoon Johnny Knoxville!. Very cool!. Wallpaper and background images in the Johnny Knoxville club tagged: johnny knoxville. Firstly, I didn't make this. The artist unknown. Secondly, I LOVE JOHNNY! I think he is absolutely fantastic and I know that he is a very intelligent guy because I have read and seen a billion interviews with him. Thirdly, this is a spoff cartoon. It is meant to be funny and poke a little fun at him. It is a joke, not an accurate representation of who he is. Ok. I just didn't want you to think that I was being rude about Johnny. I freakin' worship the guy. I just thought that this would be funny to share with people on Fanpop. Oh. Johnny Knoxville Has 3 Kiddies!